It's like the NES game, minus the world map, equipment, or Hitler's exploding head. Three pieces of music are unused. Tracks 05 and 06 are short, non-looping tracks, while 0F is a bit longer and loops. At one point it was possible to shoot the bionic arm down at an angle. These graphics weren't redrawn for the international game since there was no need to. Unused points values. There's no bonus item that gives 1000 points or a 1Up. Uses the same font as the Continue text. Obviously meant for the High Score entry. There are north and northeast arrow signs, but the right-facing one isn't used. The Danger sign could have been used anywhere, but it isn't. Some sort of centipede-monster caterpillar-monster bone-monster likely meant for Stage 1. It has animations for walking, jumping, falling, and dying. Rustling leaves. Might be related to the centipede caterpillar bone monster. A base entrance sign of a more simple style than the signs found in the final game. Some of the tiles appear to have been overwritten, so the bottom half of the sign is incomplete. Green slime that would have appeared in the sewer section of Stage 3. It could either impede or damage the player. Smaller brown slime is still unused slime. The flamethrower soldier can't jump in the final game. Again, these sprites weren't altered for the international versions of the game. A circular gate that would have appeared in the rocky part of Stage 2. A vertical version of the horizontal girders seen in Stage 2. Should have been used for the top of the girders in the second half of the level. They're not. Here are some unused sounds. Sound 23 was used to test the game's sound engine. Good luck determining what the other sounds represent. Beep boop. 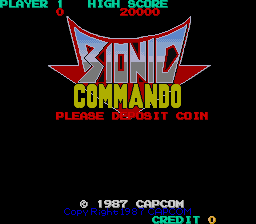 In addition to the different title, Bionic Commando is missing the bonus life information that's in Top Secret. Top Secret's HUD does not display the default weapon's icon at the beginning of a stage. This was corrected in Bionic Commando. In Top Secret, the current player isn't displayed in the HUD. In Bionic Commando, a number was added to properly indicate whether Player 1 or Player 2 was up. Here's a nice change. In Top Secret, both players use the same palette. In Bionic Commando, Player 2 uses a different, red palette, making it easier to tell whose turn is it. In Top Secret, the player's gun reverts to the default one at the start of every stage. In Bionic Commando, the player keeps whatever gun they had in the previous stage. The Clear Bonus and Time Bonus take twice as long to display in Top Secret. In Top Secret, when grabbing a ledge from an angle, there's no difference between pressing Button 2 and Left/Right: The player will start swinging. In Bionic Commando, pressing Button 2 while grabbing from an angle will instantly pull the player up. Button 2 does not need to be pressed twice. The Helicopter enemies in Top Secret are much more vicious. They can drop multiple bombs on each pass and they will never stop following the player. In Bionic Commando, they can only drop one bomb on each pass and they give up after about 12 passes. The Gate Controls in Stage 3+4 can be destroyed with the bionic arm in Top Secret. This is no longer possible in Bionic Commando, where they can only be shot. Some enemies give more points in Bionic Commando. Some enemies in Top Secret don't give any points at all! 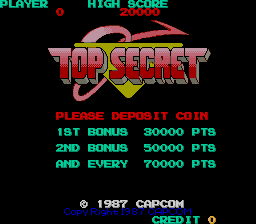 Additionally, every bonus item in Top Secret gives 100 points. This was adjusted in Bionic Commando so that all bonus items have their own point value. In Top Secret, it's possible to swing through walls with the bionic arm. 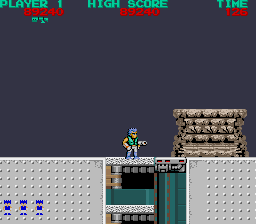 In Bionic Commando, the player will fall backwards if they hit a wall while swinging. The Gremlin enemies in Top Secret are pulled in instead of pushed away when hit with the Bionic Arm. This was changed in Bionic Commando to act like every other enemy. The exclamation points were changed. In "READY", the exclamation point was given an extra pixel of shading. In "GO", the exclamation point's white pixel was corrected to dark red. The international icon is symmetrical. Its eyes were also made transparent. Oops. "Caution" changed to "Warning". That'll keep out those intruders. This change causes the top part of the map on the sign to be misaligned. The searchlights were changed to have a semi-transparent effect. All of the human characters were redesigned for the international versions. Mostly to change their cartoony eyes. That and their thick legs. The player uses more complicated shading in the international games. His bionic arm thing was redesigned and spruced up a bit. A red dot was added to the tip of the gun, though it disappears in some frames. More detailed shading and a red line added to the gun tip. The fat soldier's arm was beefed up and a gray shading line was added to the gun. Probably the biggest design change. The big soldier was changed from a tall buff guy to a muscular ape-looking monster man. The outline on this soldier's boots are disconnected in the Japanese game. The shading under the mech's arm is thicker in the international version. The soldier's glasses and buttons' designs were changed. Changed to match the previous sprite alterations. In the Japanese game, the captain's emblem changes with each frame. The design is consistent in the international versions. An odd mistake here. In the Japanese game, the major has 3 different walking frames. In the international versions, the tiles for his second and third walking frames are identical. So, he went from having a four frame walk cycle to a two frame cycle. Also, his arm no longer moves while he's walking. He's also a bit larger. So is his gun! The disappearing pixels on the general's hat were fixed. Oh, and he's a bit taller in the international game. A handful of bug fixes in this stage. In Top Secret, using the bionic arm on the lift platform is buggy. It stays in the place where you fired it, making it misaligned with the player as they go up. This was fixed in Bionic Commando. 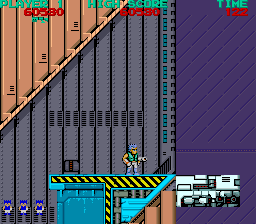 The elevator's starting position was raised in Bionic Commando so that it's properly aligned with the platform at the end. A good amount of changes in this level's difficulty, as well as a few bug fixes. 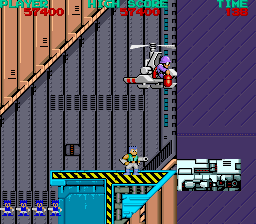 In the missile section, two Helicopter Soldiers will spawn halfway through the chamber in Top Secret. This was changed to a single Helicopter in Bionic Commando. Right before the missile core, two more Helicopter Soldiers spawn in Top Secret. These were removed completely from Bionic Commando. In Bionic Commando, the screen locks at the missile core. In Top Secret, there's no screen lock, so if the player is fast enough, they can beat the level without stopping the missile! Two Flamethrower Soldiers were added to the exit of the lift area in Bionic Commando. The position of the General's platform is misaligned in Top Secret. The last area of the game has no screen lock in Top Secret. In Bionic Commando, the left bound of the screen locks. In Top Secret, the two of the three Captains at the end of the stage are placed on the lower floor. 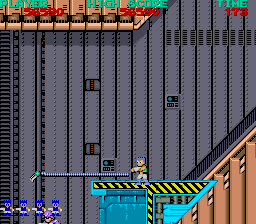 In Bionic Commando, one of those two Captains was moved to the platform where the General walks. No apostrophe in Top Secret's version of the ending. Top Secret's English font actually doesn't have an apostrophe, so one was added in Bionic Commando just to fix this error. This page was last modified on 28 May 2017, at 04:31.